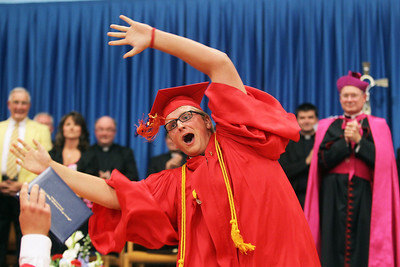 Mike Greene - mgreene@shawmedia.com Gerry McMaster leads fellow graduates in celebration following receipt of their diplomas as Bishop David J. Malloy (right) watches on during commencement ceremonies for Marian Central Catholic High School Friday, June 1, 2012 in Woodstock. 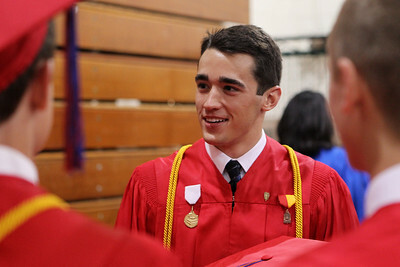 Mike Greene - mgreene@shawmedia.com Erik Carlson speaks with classmates prior to the start of commencement ceremonies for Marian Central Catholic High School Friday, June 1, 2012 in Woodstock. Mike Greene - mgreene@shawmedia.com Kayley Dvorak (left) and Erin Van Herzeele pose for a photo prior to the start of commencement ceremonies for Marian Central Catholic High School Friday, June 1, 2012 in Woodstock. Mike Greene - mgreene@shawmedia.com Taylor Ducett prepares to shake hands with Bishop David J. Malloy while receiving her diploma during commencement ceremonies for Marian Central Catholic High School Friday, June 1, 2012 in Woodstock. 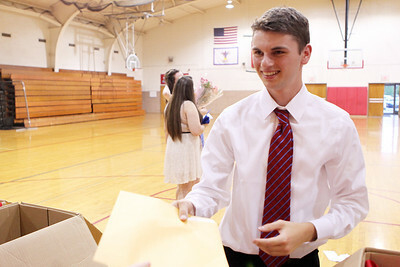 Mike Greene - mgreene@shawmedia.com Sinead Gaffney smiles while talking with friends prior to the start of commencement ceremonies for Marian Central Catholic High School Friday, June 1, 2012 in Woodstock. Mike Greene - mgreene@shawmedia.com Harmony Kendzora gets help fixing her cap prior to the start of commencement ceremonies for Marian Central Catholic High School Friday, June 1, 2012 in Woodstock. 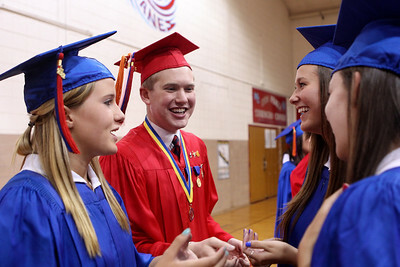 Mike Greene - mgreene@shawmedia.com Jessica Lyle, Jack Murray, Allison Kotleba and Anna Paffrath joke while waiting for the start of commencement ceremonies for Marian Central Catholic High School Friday, June 1, 2012 in Woodstock. 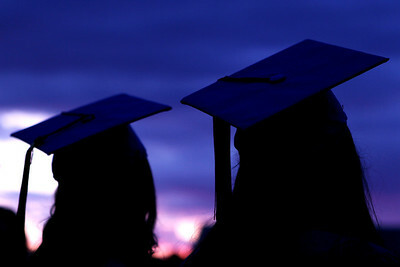 Mike Greene - mgreene@shawmedia.com Kayley Dvorak takes her seat during the start of commencement ceremonies for Marian Central Catholic High School Friday, June 1, 2012 in Woodstock. 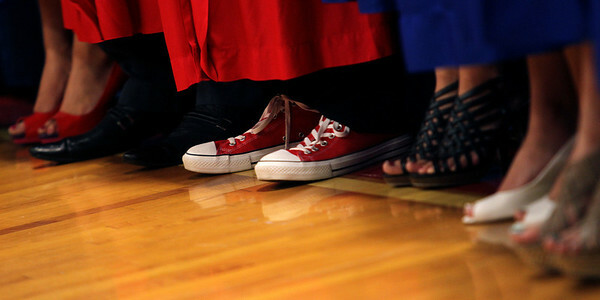 Mike Greene - mgreene@shawmedia.com Tim Manion's red Converse All-Stars stand out during commencement ceremonies for Marian Central Catholic High School Friday, June 1, 2012 in Woodstock. 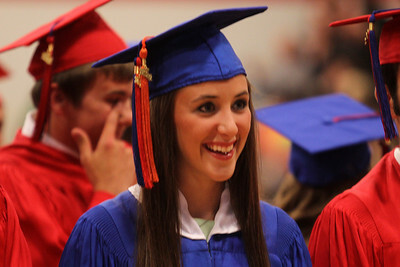 Mike Greene - mgreene@shawmedia.com Katie Simmons smiles while looking into the crowd during commencement ceremonies for Marian Central Catholic High School Friday, June 1, 2012 in Woodstock. 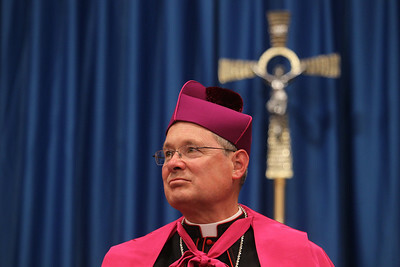 Mike Greene - mgreene@shawmedia.com Bishop David J. Malloy listens to a speaker during commencement ceremonies for Marian Central Catholic High School Friday, June 1, 2012 in Woodstock. 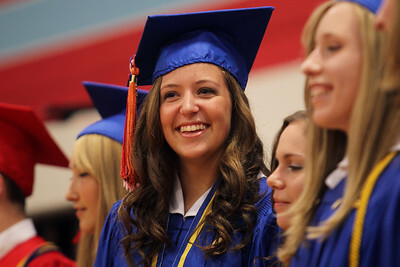 Mike Greene - mgreene@shawmedia.com Simone Awe smiles during the start of commencement ceremonies for Marian Central Catholic High School Friday, June 1, 2012 in Woodstock. 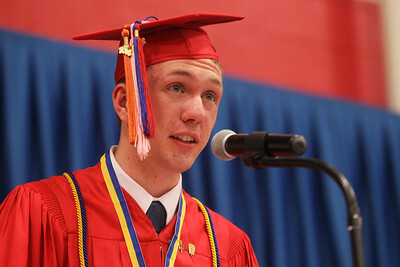 Mike Greene - mgreene@shawmedia.com Valedictorian Michael Fitzpatrick speaks during commencement ceremonies for Marian Central Catholic High School Friday, June 1, 2012 in Woodstock. Mike Greene - mgreene@shawmedia.com Becky Dowell listens to an address by class valedictorian Michael Fitzpatrick during commencement ceremonies for Marian Central Catholic High School Friday, June 1, 2012 in Woodstock. 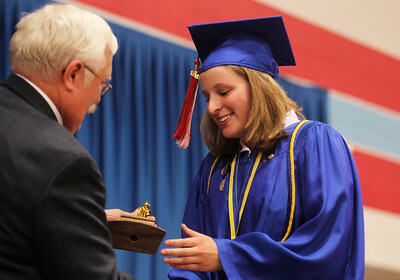 Mike Greene - mgreene@shawmedia.com Salutatorian Claire Gillespie receives an award during commencement ceremonies for Marian Central Catholic High School Friday, June 1, 2012 in Woodstock. 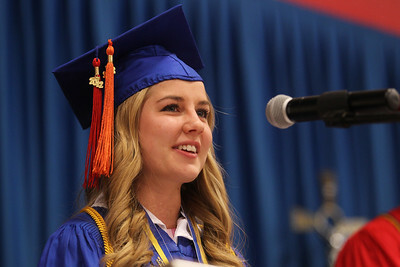 Mike Greene - mgreene@shawmedia.com Valedictorian Amanda Salvi smiles while giving an address during commencement ceremonies for Marian Central Catholic High School Friday, June 1, 2012 in Woodstock. 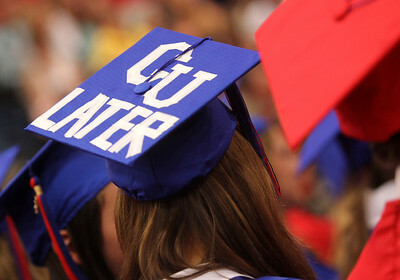 Mike Greene - mgreene@shawmedia.com Emma Hussey's "CU LATER" sign on her cap is seen during commencement ceremonies for Marian Central Catholic High School Friday, June 1, 2012 in Woodstock. 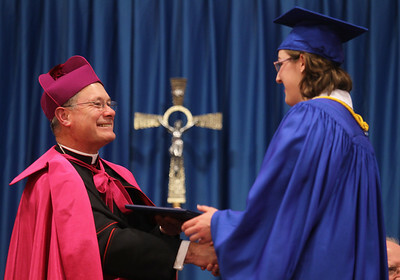 Mike Greene - mgreene@shawmedia.com Bishop David J. Malloy shakes hand with Elizabeth Reckamp while handing out diplomas during commencement ceremonies for Marian Central Catholic High School Friday, June 1, 2012 in Woodstock. 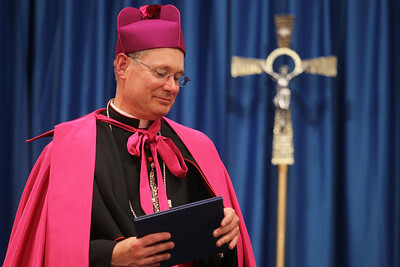 Mike Greene - mgreene@shawmedia.com Bishop David J. Malloy reviews a diploma during commencement ceremonies for Marian Central Catholic High School Friday, June 1, 2012 in Woodstock. Mike Greene - mgreene@shawmedia.com John Stotz receives his real diploma following commencement ceremonies for Marian Central Catholic High School Friday, June 1, 2012 in Woodstock. Mike Greene - mgreene@shawmedia.com Graduates pose for photos outside following commencement ceremonies for Marian Central Catholic High School Friday, June 1, 2012 in Woodstock. 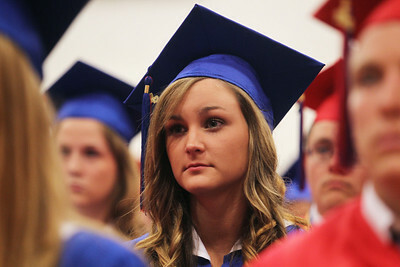 Kayley Dvorak takes her seat during the start of commencement ceremonies for Marian Central Catholic High School Friday, June 1, 2012 in Woodstock.